The Mets announced that they’ve signed infielder Dilson Herrera to a minor league contract and invited him to Major League Spring Training. Herrera, 25 in March, was long considered one of the best prospects in the Mets organization after being acquired from the Pirates in a 2013 trade. He made his MLB debut with the organization at the age of 20 back in 2014 and saw MLB action with the Mets in 2015 as well, but a series of shoulder issues slowed his development. The Mets ultimately flipped Herrera to the Reds, alongside young lefty Max Wotell, in the trade that sent Jay Bruce to New York. Herrera spent two-plus seasons in the Cincinnati organization but appeared in just 53 games late in the 2018 campaign, posting a dismal .184/.268/.414 slash in 97 plate appearances. Though he was a seldom-used bench piece for the Reds after his call to the big leagues, Herrera did enjoy a solid season with their Triple-A affiliate in 2018. Through 50 games and 208 plate appearances, Herrera hit .297/.367/.467 with seven homers and 10 doubles. The Reds announced Friday that they’ve selected the contract of infielder Dilson Herrera from Triple-A Louisville. It’ll mark not only the Reds debut for the 24-year-old, but his first MLB action since a 2015 trial run with the Mets. Left-hander Cody Reed was optioned to Louisville in a corresponding move. Herrera came to the Reds alongside left-hander Max Wotell (who was released yesterday) in the 2016 trade that sent Jay Bruce to the Mets. While Herrera was once viewed as a premium prospect, shoulder troubles have slowed his development in recent years — to the point where Herrera actually went unclaimed on waivers last year and was outrighted off Cincinnati’s 40-man roster. So far in 2018, however, Herrera has made great strides in rebuilding his stock. He opened the season at Class-A Advanced as he eased his way back into things following 2017 shoulder surgery but quickly proved ready for a greater challenge, hitting .298/.359/.429 through 21 games in the Florida State League. The Reds then bumped Herrera back up to Triple-A, where he’s batted .297/.367/.465 with seven homers and 10 doubles through 208 plate appearances. It’s been a long road back to the Majors for Herrera, and while there’s no immediate opening for him to receive everyday at-bats in Cincinnati with Scooter Gennett at second base and Eugenio Suarez at third base, that could change in the coming weeks. Gennett, after all, is a potential trade candidate given that he has just a season and a half remaining until reaching free agency. Herrera could also simply function as a bench piece, spelling both Gennett and Suarez occasionally while serving as a pinch-hitting option late in games. Whatever his role, Herrera will at the very least deepen the Cincinnati bench for the time being as he hopes to play is way into more prominent standing with the organization down the road. Reds infielder Dilson Herrera has been outrighted to Triple-A after clearing waivers, per C. Trent Rosecrans of The Athletic (via Twitter). The Reds have since announced the move. Herrera will remain in MLB camp for the time being but obviously will not be expected to make the active roster out of Spring Training. Circumstances have combined to change Herrera’s once-promising outlook in the Cincinnati organization. He struggled to a .264/.312/.397 slash in 264 Triple-A plate appearances last year before shoulder surgery ended his season. In the meantime, the club not only oversaw the surprising emergence of Scooter Gennett but has also seen the development of other infield talent. That said, Herrera is still just 24 years of age and should have every opportunity of regaining his trajectory. He has mostly produced quality offensive numbers in the upper minors, including a .289/.345/.460 slash in over a thousand total trips to the plate at Triple-A. Herrera, who was acquired in the 2016 deal that sent Jay Bruce to the Mets, will now have too earn his way back onto the MLB roster. The Reds will no doubt be glad to have held onto Herrera, who is out of options, after deciding not to keep him in the majors to open the year. Reds infielder Dilson Herrera will undergo surgery to remove bone spurs from his right shoulder, as C. Trent Rosecrans of the Cincinnati Enquirer reports on Twitter. The procedure is expected to bring Herrera’s season to an end, per MLB.com’s Mark Sheldon (via Twitter). Herrera has tasted the majors previously, during his time with the Mets, but has spent his entire tenure in the Reds organization at Triple-A since coming over in last year’s Jay Bruce swap. Shoulder troubles had increasingly become a concern for the 23-year-old over the course of the year. The news brings an unhappy end to what has been a challenging season for Herrera. Expected to push for MLB time, he has managed only a .264/.312/.397 batting line with seven home runs over 264 plate appearances. If he’s able to return to health in time, a fall or winter ball stint may be in the cards. It had been hoped that Herrera would play a significant role on the Reds’ 2018 roster. While that may still occur, he has surely fallen behind the surprising Scooter Gennett in the pecking order at second base. 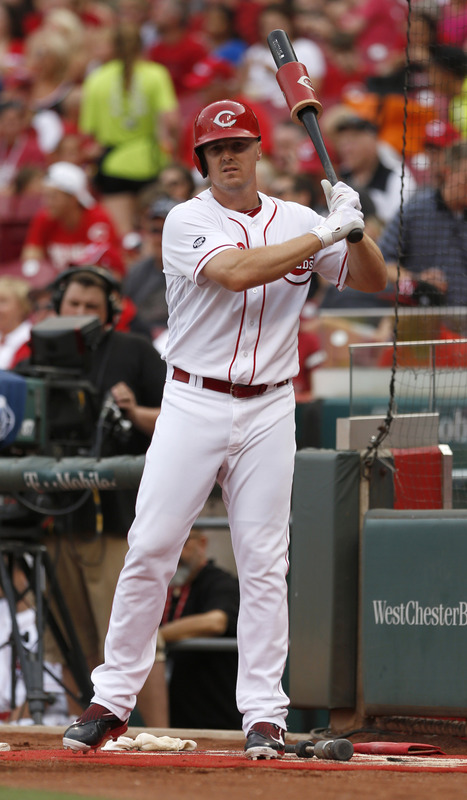 After a snag in the medical reviews of a Mets prospect derailed an earlier version of the trade, the Mets and Reds announced today that Jay Bruce has been traded to Cincinnati in exchange for minor league second baseman Dilson Herrera and minor league left-hander Max Wotell. Top outfield prospect Brandon Nimmo was originally said to be in the deal, and while he wasn’t the player whose medicals sank the first iteration of the trade, he is no longer included in this version. Cincinnati came close to moving Bruce during Spring Training in a supposed three-team deal, but medical reviews of some of the minor leaguers involved torpedoed the deal. That looks quite fortuitous for Cincinnati now, as Bruce’s huge season has rebuilt his trade stock substantially. Bruce underwent arthroscopic knee surgery early in the 2014 season and rushed back in less than a month, and he didn’t look like himself at the plate in either 2014 or 2015 (combined .222/.288/.406 slash line). Now, he’ll be moved for a stronger package of young talent than he’d have fetched about four months ago. Bruce will provide the Mets with a power bat to slot into the corner outfield mix, although his acquisition likely pushes some combination of Curtis Granderson and Michael Conforto into center field due to Yoenis Cespedes’ now-infamous preference to remain in left field. Certainly, that defensive alignment is sub-optimal, as Bruce’s defensive ratings have plummeted this season, but the Mets have long appeared more concerned with ratcheting up their offensive production (e.g. placing Yoenis Cespedes in center field, signing Asdrubal Cabrera to play shortstop) and seem content to live with a sub-par defensive alignment in order to achieve that end. Herrera, 22, is no longer considered a “prospect” because he’s tallied 169 big league plate appearances, but he becomes a vital future piece for the Reds and is the unequivocal centerpiece of this deal. The 22-year-old has batted just .215/.308/.383 in his limited big league playing time, but he’s yet to receive an opportunity to play on a regular basis. One would imagine that the Reds will afford him with that opportunity in the near future, giving them a look at a player that has been pegged by many scouting reports as a possible big league regular. Herrera is a career .300/.354/.485 hitter in 753 Triple-A plate appearances, displaying a blend of power and speed that has resulted in 24 homers and 19 steals at that level. Brandon Phillips is blocking him at second base, but it’s conceivable that the Reds’ long-term middle infield tandem will consist of Herrera and Jose Peraza. Whether or not that duo lines up in the middle infield, they both figure to be key factors in the Reds’ emerging young core. Wotell, 19, has already been slotted in as Cincinnati’s No. 22 prospect by Jonathan Mayo and Jim Callis at MLB.com. He’s yet to pitch above Rookie ball since being selected in the third round of last season’s draft, though he has a solid 3.57 ERA with 10.5 K/9 against 4.7 BB/9 in 40 1/3 innings between the Gulf Coast League and Appalachian League. Callis and Mayo write that he sits 90-91 mph with his heater but can touch 95 and has room to add to his 6’3″ frame. Wotell’s breaking ball has plus potential but he needs to smooth out his delivery and work on his command, the MLB.com duo notes. Buster Olney and Jerry Crasnick of ESPN, FOX’s Ken Rosenthal and Joel Sherman of the New York Post did a great deal of the reporting on the initial trade. Olney reported that a restructured deal was close to completion (Twitter link). Yahoo’s Jeff Passan reported originally called the Mets the favorites and said that the restructured deal was done (via Twitter). Rosenthal tweeted that Herrera was in the deal instead of Nimmo. MLB.com’s Jonathan Mayo tweeted that Wotell was the second player going to Cincinnati.